It’s been awhile but our Twitter reviewer Tim Schilling is back with a brand new tweet by tweet review on “Leatherface: The Texas Chainsaw Massacre 3.” The film was a box office bomb when released grossing less than $10 million in theaters and receiving harsh criticism among both fans and critics of the series. Out on DVD in an unrated cut, does the film deserve the scorn it received or does the added carnage make the film worth the buzz? 0:02 Oh hey Ken Foree. I didn’t know you were in this. 0:15 …when is something gonna happen. 0:18 There’s at least one Psycho reference in every slasher film. 0:22 This chase scene makes no sense.It was day when they left,guy in the truck left at night, now they’re together. 0:26 Leatherface what did I tell you about coming out of no where and making me jump like that! 0:27 How did this woman get her license!? She hits everything on the road! 0:31 Ken Foree doesn’t age. 0:38 Leatherface is like a ninja in this one with all his little gadgets and how he keeps appearing out of nowhere. 0:45 The Texas in this series is completely different in each movie. Very few things are simar about the setting. 0:50 Grandpa looks dead again. I bet he’s gonna walk around later as usual like nothing happened. 1:01 I just want Leatherface to be as mean as he was in the first one. 1:06 No Leatherface, ‘food’ is not the correct way to spell Santa. Try again. 1:12 These fight scenes have great music. 1:15 Chainsaws don’t float around in water! I’m not sure why I love The Texas Chainsaw series as much as I do, and Leatherface: The Texas Chainsaw Massacre III just proves it again. 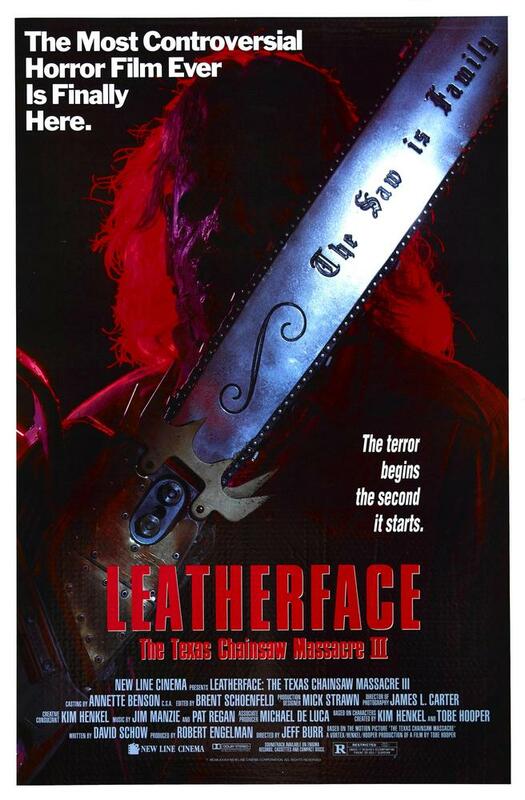 Leatherface: The Texas Chainsaw Massacre III was a good spin on the simple story that the first made, I loved the sets, and all the characters were different from each other and the characters from the other movies which made it even more entertaining.